The course addresses sustainable land management from a technical and scientific perspective, but is written in a language suitable for the general public. Individuals who would especially benefit the most from taking the course include land and policy makers, land and water management technicians, extension service agents, agronomists, as well as farmers and land users. This course focuses on Sustainable Land Management (SLM) practices, and their place within the global development agenda, specifically in order to achieve target 15.3 of the Sustainable Development Goals (SDGs), which aims ‘’to achieve a land degradation-neutral world’’. The course assists policy makers, practitioners and land users in the selection, planning, implementation and monitoring of SLM interventions, and related enabling environment. 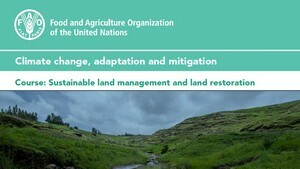 The concept of Land Degradation Neutrality (LDN).